I always knew knitters were good souls. I knew they were a generous bunch. And when I was feeling low last week, I knew I could turn to some tried-and-true bloggers, who’ve known me from almost the very start, for some sympathy, emails, and more people to gmail chat with if I needed. I didn’t expect the amazing responses I’ve gotten–from thoughtful suggestions for what to knit, to taking the time to share personal stories with me, and now? Sending me care packages!! Two skeins of Koigu KPPPM, featuring greens and browns–maybe a little bit mint-chocolatey, hmmm? The card is a sweet little Hello Kitty card. 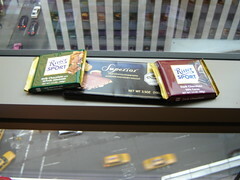 Three different kinds of chocolates–featuring a lot of almonds, which I adore, and delicious dark chocolate. Back when I filled out that 48 things you didn’t want to know, it asked about favorite flavors, and I totally neglected my beloved almond! Gosh, Laura, thank you so so, so so much. I’ll definitely knit something special out of this yarn. Care packages really deliver on their name: you feel so cared for! 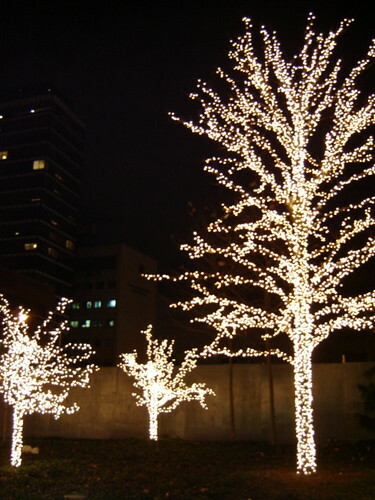 I leave you with another shot of lights on trees. I found this whole courtyard full of them and made a special detour, despite the freezing, windy weather, to snap some shots tonight. Thanks for all the comments on the last post! The spam is back under control. But keep commenting!!! Love the trees. Love New York at Christmas. Sigh. That Koigu looks exactly like the Koigu I used on a scarf for grandma. And there’s nothing more adorable than Hello Kitty. Glad some knitters could lift your spirits! New York is an amazing place over Christmas. I used to love it (I lived in NY when I graduated from college)… the lights, the bustle of shoppers, the crispness in the air… the lights on those trees are incredible! The trees are beautiful! Thanks for going out of your way to share the picture. Those trees – I’m so jealous. All we have are palm trees with lights wrapped around them. Ugh. I reckon the trees are feeling as cared for as you are. I remember the Elby’s Family Restaurant in my home town used to be the only place in town that decorated the trees like that – it used to fascinate me! That is so sweet! I hope things are looking up, girl. I’m so glad you are getting love from all around. You deserve it. Have a good weekend! Ooh, mint chocolate socks — fun! What a nice care package. That Laura isn’t half bad, is she? Your whole office is moving across the street? I hope you like your new digs. care packages are the bestest! it’s nice when someone shows that they care :) great colors on that koigu. you’re a lucky girl! by the way, were the spammers actually getting into your comments on the site? i see that you have the captcha on your comment field so i’m surprised that they got past that! It’s great to know that you’re so cared for (and that your co-workers miss you…they sound like a great bunch). I love that view from your office! Right now the view from my office it the window next to my kitchen table, looking out into the alley. :-) Ah well, it could be worse. Beautiful pics. That Laura sure is a sweetie.